Offering a catered corporate lunch for your employees or clients is a simple and easy way to impress and boost morale. It is also fully tax deductible so a plus for the end of year balance sheet. Take the stress out of organising a lunch and chat to one of our event managers about a menu to suit your particular group. We can create customized packages that accommodate particular dietary requirements and are friendly on your wallet too! If you are providing corporate lunch catering for your employees in lieu of longer lunch breaks this will result in higher productivity across the board. If you are able to cut their lunch break by even 5 minutes this saving might cover the catered lunches themselves. Providing nutrient rich, healthy lunch options for your employees will result in healthier, more productive and happier employees. 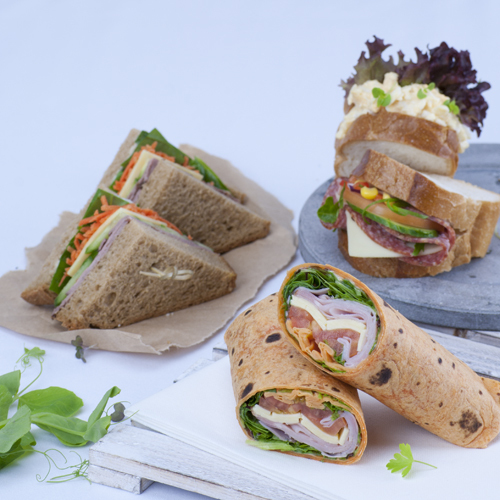 Sandwiches are the go-to staple for your corporate lunch catering needs! Many people are now very discerning when it comes to what food they eat, where that food comes from and how it is packaged and delivered. Providing nutrient rich, healthy catering options for your corporate meetings will impress your clients and leave a memorable impression. Flavours Catering uses only fresh ingredients when preparing their meals daily. Ensuring that you keep your employees morale high is key to a happy and productive team. When employee morale is high most employees feel loyalty towards the companies that they work for – in other words “the grass doesn’t look quite as green on the other side of the fence”. This loyalty will in turn produce a lower staff turnover rate. One of the easiest ways to do this is to provide a catered corporate lunch. If you can’t justify the cost initially for every day even if it is only once a week having gourmet sandwich catering delivered to your office will be a perk that is not forgotten by the staff. For your next all day conference why not order one of our all day catering packages? Morning and afternoon tea items will be delivered in combination with sandwich platters, salads as well as beverages if you would like. ‘Three thirty-itis will be a thing of the past!